Today we had a full day off the motorcycles to enjoy Lake Como. Well at least Kim and I had relaxing days. Duane took a cab to the local hospital to have his arm checked out. After a few X-rays and a consultation it was determined Duane had indeed broken a bone in his arm. The doctors recommended a cast but when Duane said no because he was riding a motorcycle around Europe they went into immediate excited Italian with each other. They must have thought he was crazy. No one has ever accused people who ride motorcycles of good judgement. Two more days and we are in Venice for a week which should give him some time to recover. I had a very relaxing day. Walked around town for a couple of hours. Took a few photos with my cell phone and camera just so you could see how magical Lake Como is. (Check out my blog for photos ) Then I found a nice park bench by the lake and sat and read for a few hours. Some time in the day I found some time to have lunch and wine with Kim and dinner and wine with Duane. This evening our friend from Switzerland, Georg, and his friend rode in on their motorcycles to join us tomorrow on a ride. We plan to ride up the lake shore to Balagio which I have heard is another amazing town on the lake and then ferry across the lake to tour the Moto Guzzi motorcycle factory. I am sure we will stop for lunch in there some time. Late in the afternoon we will part ways with our friends from Switzerland and ride a couple of hours towards Venice. That way Thursday AM we have a quick ride to get to Venice and start enjoying our week of R&R. And I get to see my wife Bonnie.. 🙂 Duane’s wife Linda is also flying is and so is my daughter Sarah so it should be a fun week there. All great people. Our friends from Switzerland arrived around 7pm tonight and expressed how tired they were riding all the way from their country to northern Italy. When I asked them how long it took they said “Two Hours!”.. Wow two hours after we had ridden 8+ hours to get here. I have been known to be a “bit of a tease” and let them have it, that two hours is normally a warm up ride before breakfast, not great ride.. Our friends have a great sense of humor and we all laughed. After a day off the bikes I am looking forward to riding tomorrow. Also I did manage to find a laundry service so it will be nice to have ALL clean clothes tomorrow. It appears our intrepid rider, Duane has indeed broken a bone in his arm. Being the tough guy he is, he is insisting to keep riding. Enjoying a relaxing few hours reading by Lake Como. Our noble steeds enjoying a day off the road. I spent a few hours walking around the city and taking a few photos so you can see how beautiful it is. 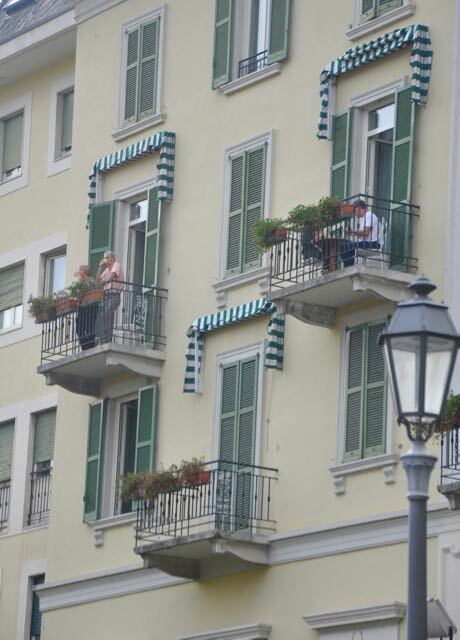 The beautiful old hotel we are staying at, overlooking Lake Como. A cool Cafe Racer in a local shop window. After three weeks of riding a motorcycle and three months of dieting I am not sure which looks more appealing…. 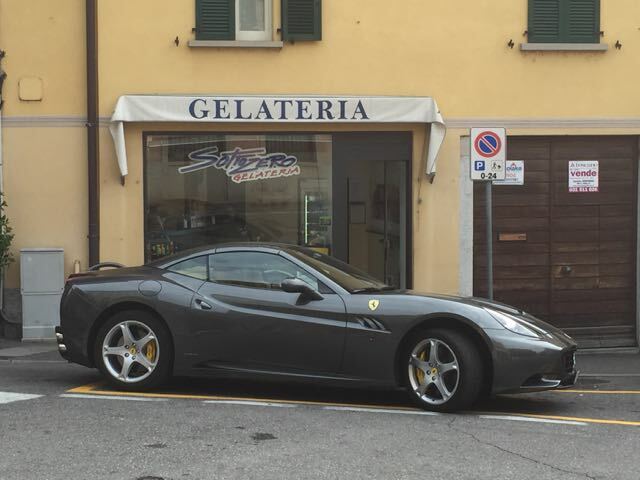 A Ferrari to drive and a delicious pastry from the shop behind it..
about this topic for a long time and yours is the greatest I’ve found out so far. message house a little bit, however other than that, that is magnificent blog. every one be able to effortlessly be aware of it, Thanks a lot. web for that purpose, and get the most recent news. of the articles I realized it’s new to me. Anyways, I’m certainly pleased I came across it and I’ll be book-marking it and checking back often!